Guess what guys ? 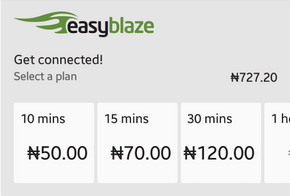 9Mobile introduces a Time Base Data Plans know as BlazeOn for unlimited browsing , this plans gives way for unlimited browsing and download during the given time frame you opt for . AIRTEL were the first to introduced something similar to this back 2015 but along the line something led to its fading . This 9Mobile timely based data plans would be very beneficial to those subscribers who has fast Etisalat Network and also has heavy files to download. According to 9Mobile "most internet users in Nigeria don't know how much data they consume while streaming or browsing" and then this plan was launched . The 9Mobile timely based data plans is made possible by an app called BlazeOn And it is powered by Comptel's FWD solution. Below are the list of its data plans and price . or you can go for the 1hour plan . NOTE: This plan is advisable for users with strong Etisalat Network in their Area , or you might regret with poor network . Just Download BlazeOn App from play store. Or Download its Apk here . Then set up the app and you're on . thanks sir for the info.